When we picked up our mattresses we met your wife, and she is such a nice person! We took the custom made mattresses home: they fit perfectly and we slept and sleep like babies on clouds. Thank you so much for your help! Dear Yong, Thanks so much for your attention to the multiple problems we were experiencing with our bed. The repairs were quick, professional and extremely helpful to our peace of mind and comfort. 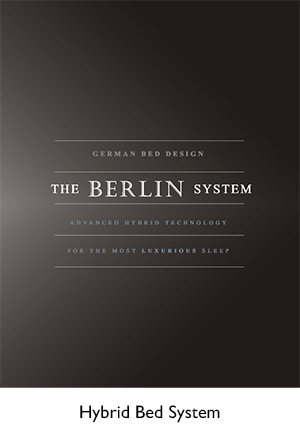 We recently purchased an Austrian sleep system composed of 2 twin X-long Silver Star bed bases and DW 400 mattresses from Axel Bloom and are very pleased with it. Both my husband and I found the mattresses and slat bases extremely comfortable from the fist night on. Our previous standard American king size pillow top mattress developed a ridge down the middle early on which caused me to roll away from the middle as well as causing the arm I most frequently rested to fall asleep regularly. So far I have not experienced any of these problems on our DW 400 mattresses. Also, by placing 2 twin slat bases next to each other we eliminated any energy transfer resulting in improved sleep. The memory foam pillows we purchased from Axel Bloom are easy on the neck and disperse heat much better than the standard memory foam pillows that I had used before. Mr. Yong Lee, owner of the company, was very professional and courteous and was a pleasure to work with. He took a personal interest to make sure that we would get just the right sleep components and assisted us with any questions we had. We love the bed! It is fantastic. Thanks so much for all your kind help in choosing the bed and helping us put it together. The fit could not be more perfect and the bed looks beautiful. I had placed the back mattress stopper in backwards so it looked really funny but we figured it out before we got your picture. I am glad that David was able to also figure out the problem of two surge protectors in line with each other. I bought another (Better) one and used the old one as an extension cord. Perhaps I should open up Axel Bloom North! Regards to Bonnie and Joyce and have a wonderful Sunday. Finally got my bed assembled! Thank you very much for all the help you have given me. I unpacked everything, except the mattress, last night. This morning, Heath and Zach, unpacked the mattress and assembled the bed. Heath and Zach do maintenance for this building, but the tenants here also hire them to do work for their units. During the assembly process, both of them were very impressed with customer service provided by Yong, the material and the craftsmanship of the bed, and the ease of installation. They recognize real furniture when they see it. They finally commented that the bed must have cost an astronomical sum and had to ask how much I paid for it. When they finished, Heath was impressed with our communication with you using Apple FaceTime and Zach said he had to look up AxelBloom. Thank you for helping me pick the fabric and the mattress. It is not easy to make this kind of decisions over the phone and the Internet. But so far, I am very happy with what I saw. Thank you for your support on installation. The guys here were impressed, and I was impressed when you called in the morning to check on progress. Zach works for Heath as a contractor. Both of them work in this building every weekday. Feel free to call me if you need me to track Heath down. When I get the bill from him, I will let you know how much he charges me. I have known Heath for 5 years since I moved into this building. I would gladly serve as his professional reference. 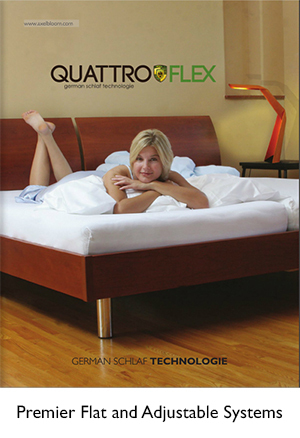 My wife and I bought a Berlin mattress and Silverstar GT suspension about six weeks ago. Not only was the sales process and service first rate, but we absolutely love the product! My wife is from Switzerland and I lived there for a good part of my life. We are therefore both more accustomed to German sleep systems and were never quite comfortable with what was normally available here in the United States. Also, after sleeping on a memory foam mattress for four years, my wife developed very painful backaches. Enter Axel Bloom. The past six weeks have done wonders for my wife's back, and I would never want to do without the luxury of our new mattress. Thank you, Yong and Bonnie, for your excellent advice and a very pleasant shopping experience! The bed arrived ready to go and has been installed. My brother loves it so far. Thanks so much for all your attention to detail. I have to say that customer service is exceptional at Axel Bloom--the last time, years ago, and this time.